Sonos, granddaddy of the connected home audio marketplace, is now 15 years old. Sonos was a pioneer that was so far ahead of its time, it inadvertently found itself as one of the key early drivers of streaming subscriptions. Visionary founders John MacFarlane and Tom Cullen had some long-term inkling that streaming would eventually be a major force for them, but their near-term vision was built on getting music downloads piped around the home. Now, 15 years on, Sonos has effectively achieved two missions: deploying iTunes around the home, as well as Spotify and co around the home. But now, the outlook is less clear. Sonos’s marketplace is complex and competitive more than ever. Furthermore, the departure of MacFarlane, a round of lay-offs and having ‘missed voice’, may have left Sonos looking less vibrant than it once did. So, where next for Sonos? Battle of the apps: Sonos hardware reflects the company’s obsession with elegance and attention to detail. But, as with so many hardware companies (in fact the majority of them), Sonos’s weak point is software. Apple makes seamless software-hardware integration look deceptively easy – it is, in fact, nigh on impossible to do well. The Sonos app works well enough, certainly much better than it used to, and the networking of devices is usually relatively pain free. But in the app economy, consumers expect apps to work perfectly, not ‘well enough’. They expect high-quality user experiences, not functional experiences with lots of clicks and swipes, which is what Sonos can feel like when doing activities like building playlists. In spite of this, the biggest software threat for Sonos is the very fact that it is a standalone app. A Spotify user does not want to have one app to use on the train, or in the car, and a different one to use in the home. This is what Sonos effectively does right now. Sonos’s new CEO, Patrick Spence, knows this needs fixing but the question is whether Sonos can make the fix before Spotify and co come up with their own fix. Just play: Traditional home audio just works. You press play and there’s music. Sonos stood out way ahead of the pack – an admittedly poor quality pack – for out-of-the-box simplicity, though even now it remains a marker of good practice. However, the convenience benchmark for connected home audio still falls far short of traditional home audio. Sonos works most of the time, emphasis on most of the time. Every so often there’s a network problem; sometimes this is due to a firmware issue, other times it is the network itself. The network glitches of course aren’t Sonos’s fault but that doesn’t matter to the user experience. A CD player works every time, Wi-Fi or not. That is the convenience benchmark Sonos and all other connected audio players must meet. But even without Wi-Fi issues, pressing play is not always so straight forward because Sonos’s app experience is not on a par with its hardware experience. Sonos…sonos….sonos…: Ok, that was meant to be an Echo. Yes, Amazon’s Alexa vehicle has totally shaken up the connected home audio space. And with Amazon Music integration, it sets a standard for what an integrated hardware-software service experience should be. One voice command pulls up a song in an instant, no having to select which music source to choose. Yet Echo is far from the end game. In fact, voice is not an ideal interface for music. It’s fine for when you know exactly what you want to play, it’s also pretty good for when you want to select a lean back experience e.g. ‘play me music to work out’ – but it struggles with the more nuanced use cases that lie in between. Voice is another thing that Spence knows needs fixing. Good enough: And of course, the Echo is not a super high-quality audio experience. It’s a decent audio experience. Sonos might grumble at otherwise sophisticated users tolerating modest audio playback, but ever since the advent of MP3s and iPod earbuds, convenience trumps quality for most when it comes to music. Even Sonos is guilty of playing the convenience game. Though its speaker quality has improved, Sonos speakers are still a long way off the audio specs audiophiles seek. And yet, even this isn’t the biggest challenge for Sonos. The core problem Sonos faces is that the likes of Amazon, Google and even Apple are not focused on winning the home audio race, instead they view smart speakers as a beachhead for controlling the smart home. That is the war, home audio is the first battle. Just as Apple used the iPod as the first step towards winning the personal digital life war, smart speakers are being used in the same way in the home. Sonos is also upping its game and tweaking its strategy. The recently launched PlayBase shows both high-quality product design and a recognition that TV is the next big battle Sonos needs to fight, having already made good ground with its PlayBar. Sonos needs all the strategic nous and product excellence it can get. It has the low-end and high-end squeezing it in a pincer movement, while the big tech companies carpet bomb its heartland simply to gain a foothold in the smart home. Five years ago, Sonos was the golden child of its market. Now it is a company with a very strong brand in need of some laser focussed positioning in a remarkably competitive field. Sonos has enviable foundations, it now needs to build a new house. Universal Music and Spotify have finally agreed on terms for the streaming service’s new licensing deal which reportedly includes better rates tied to growth targets and premium windowing. Check out Tim Ingham’s piece for detail on the deal. Although the big focus across the industry so far is, understandably, on what this means for Spotify, it is also part of a bigger story, namely that of the maturation of the streaming market and its associated business models. Firstly, what it means for Spotify. As I have written previously, Spotify needs to create a strong narrative for Wall Street if it is going to IPO successfully. Within that narrative it needs to demonstrate that it is embarking on a journey of change even if the destination is some way off yet. Its relationship with the labels is central to that. Paying out more than 80% of revenue for ‘royalty distribution and other costs’ on a cash flow basis is not something potential investors exactly look upon with unbound enthusiasm. In pure commercial terms Spotify actually pays out round about the same amount (c70%) of revenues to rights holders as Netflix does, but because Netflix owns so much of its own rights it can amortize the costs of them to help generate a net profit while Spotify cannot. The 2 ways of fixing that are 1) owning copyrights, 2) reducing rates to rights holders (which really means labels as publishers are pushing for higher rates). It is probably too early to flick the switch on the ‘Spotify as a label’ strategy as that would antagonize labels at exactly the wrong time. So reducing rates is the main lever left to pull. However, the labels feel the rates are fair value, in fact many think the rates undervalue their content assets. So Spotify was never going to achieve a dramatic change in rates at this stage. Also, labels are wary of granting better terms to Spotify because Apple and co will immediately demand the same. Hence UMG has tied Spotify’s lower rates to growth targets, which you can rest assured will be ambitious. Why? Firstly the labels need continued big growth. The global music business grew by around 1 billion dollars last year, with streaming growing by 2 billion dollars. Thus without streaming’s growth the music business would have declined by 1 billion dollars instead of growing by that much. The labels cannot afford for streaming growth to be smaller than the amount by which legacy formats decline. Secondly, Spotify needs better deals more than many of its competitors, so is more willing to agree to ambitious growth targets. Apple and Amazon (who both make their money elsewhere and aren’t prepping for an IPO) are less concerned about better rates and are less likely to be willing to be tied to strong growth targets. So UMG has a win win here. It gets Spotify tied into ambitious growth without a major risk of having to also give lower rates to Apple and Amazon. While there is a risk that windowing may give piracy a little boost, those consumers that choose to Torrent rather than upgrade or simply wait 2 weeks were never realistic targets for the 9.99 tier anyway. What we may well see is a spike in uptake of free trials and the ‘$1 for 3 months’ super trials. The UMG – Spotify deal is more than just an agreement between 2 parties. It is the start of the next chapter in relationships between streaming services and labels. A deepening and strengthening of links. It is of course a unique product of its time (ie Spotify needing to get its house in order ahead of the IPO) but market defining precedents are often born out of such circumstances. Such as the time when AOL Time Warner wanted to ‘get smart with music’ following its recent merger and promptly sent off Warner Music’s CEO Roger Ames with Paul Vidich to carve out the iTunes deal with Steve Jobs. Back then Apple was focused on trying to jump start iPod sales. Now though the labels need Spotify to start building a sustainable business. It is not enough for Spotify to simply clear the IPO hurdle, it needs to land on its feet and maintain speed. So while it’s great to see that UMG and Spotify have hit upon a framework for delivering better rates in return for better growth, Spotify must be careful to ensure that it grows sustainably and not pursue growth at any cost. 2016 was inarguably a great year for both streaming and the labels. This deal has the potential to lay the foundations for an even better 2017 and beyond. So the Beatles are finally coming to streaming…well much of the Beatles’ catalogue is at least. Is it a big deal? Kind of. The Beatles were late to iTunes and they’re now late to streaming. Fashionably late though. No so soon as to be left standing awkwardly waiting for something to happen and not too late to miss the real action. The Beatles are unique enough, and important enough to dictate their own terms and set their own timetable. For streaming services the Beatles catalogue is strategically important in the way it was for iTunes in that it helps communicate the value proposition of all the music in the world…well most of it. For the Beatles it represents the opportunity to reach younger audiences that sales are currently missing (which in large part explains why the catalogue is being made available on free tiers too). 20 years ago everyone pretty much bought the same product, the CD. Now though the music consumer landscape is fragmented and siloed. The fact that Adele’s ‘Hello’ simultaneously delivered stellar performance across audio streaming, video streaming, download sales and radio illustrates that there are many highly distinct groups of consumers that do one but not the other. This what Universal will be banking on with bringing the Beatles to streaming: they’ll be hoping that most of the future prospective buyers of Beatles albums are not streaming. For as long as this elongated transition phase continues, this sort of approach can work. What Happens When The Bottom Falls Out Of the Catalogue Business? The business model of record labels has long depended on revenue from back catalogue propping up the loss-leading new artists, on whom labels have to spend heavily to break. That model works as long as back catalogue sales are vibrant. But cracks are now showing in that model. Labels, especially the big ones, are increasingly spending even more heavily on a smaller number of big bets. For major labels many of these are either manufactured or laser targeted pop acts that grow big fast but like genetically modified crops, soak the nutrients out of their fan-base soil and are less likely to have long term careers. This means breaking artists are costing more to break and have less long term revenue potential. That double whammy in itself would be bad enough, but there is an even more important structural factor at play. Catalogue sales depend on people buying classic albums, reissues and retrospectives. The secret is in the term ‘sales’. The model does not translate the same way to sales. Getting someone to spend $10 on an album for old times’ sake that they might listen to a handful of times but value having in their collection is very different from earning $0.20 or so from the same number of listens. But that is the way the world is heading. Older music buyers (i.e. from late 30’s onwards) are the lifeblood of catalogue sales. That model works for older consumers that grew up buying music and thus have the habit. But what happens what happens when the first millennials enter their late 30s? Which is exactly what is going to start happening from 2016 onwards. As each new cohort of aging millennials passes 35 a smaller percentage of them will have ever regularly bought music. Thus from 2016 onwards every year will mean an ever smaller number of catalogue buyers coming into the top of the funnel. The long term implications are clear. While this will not be anything like an instant collapse, the impact will be progressively more painful as each year passes. The old label model of developing a vast bank of copyrights will become less and less relevant. So Beatles, welcome to streaming, this will be your last new format hurrah. The outstanding success of Adele’s single ‘Hello’ has stoked up the already eager debate around whether Adele’s forthcoming ‘25’ album is going to be a success. Indeed some are asking whether it is going to ‘save the industry’. One of the aspects that is getting a lot of attention is whether the album is going to be held back from some or all of the streaming services. The parallels with Taylor Swift’s ‘1989’ are clear, especially because both Swift and Adele are strong album artists, which is an increasingly rare commodity these days. But the similarities do not go much further. In fact the two artists have dramatically different audience profiles which is why streaming plays a very different role for Adele than it does for Swift. Adele’s ’21’ was a stand out success, selling 30 million copies globally. Core to ‘21’s commercial success was that the album touched so many people and in doing so pulled lapsed and infrequent music buyers out of the woodwork. The question is whether the feat can be repeated? In many respects it looks a tall ask. We’re 4 years on since the launch of ‘21’ and the music world has changed. Music sales revenue (downloads and CDs) have fallen by a quarter while streaming revenues have tripled. And the problem with pulling lapsed and infrequent buyers out of the woodwork is that they have receded even further 4 years on. In fact a chunk of them are gone for good as buyers. But beneath the headline numbers the picture is more nuanced (see graphic). Looking at mid-year 2015 consumer data from the US we can see that music buyers (i.e. CD buyers and download buyers) are still a largely distinct group from free streamers (excluding YouTube). While this may seem counter intuitive it is in fact evidence of the twin speed music consumer landscape that is emerging. This is why ‘Hello’ was both a streaming success (the 2nd fastest Vevo video to reach 100m views) and a sales success (the first ever song to sell a million downloads in one week in the US). These are two largely distinct groups of consumers. As a reader of this blog you probably live much or most of your music life digitally, but for vast swathes of the population, including many music buyers, this is simply not the case. Given that the mainstream audience was so key to ‘21’s success we can make a sensible assumption that many of these will also fall into the 27% of consumers that buy music but do not stream. The implication is thus that being on streaming really is not that big of a deal for ‘25’ one way or the other. Whereas Taylor Swift’s audience is young and streams avidly, Adele’s is not. That is not to say there aren’t young Adele fans, of course there are, but they are a far smaller portion of Adele’s fan base than Swift’s. 60% of 16-24 year olds stream while just 20% buy CDs. 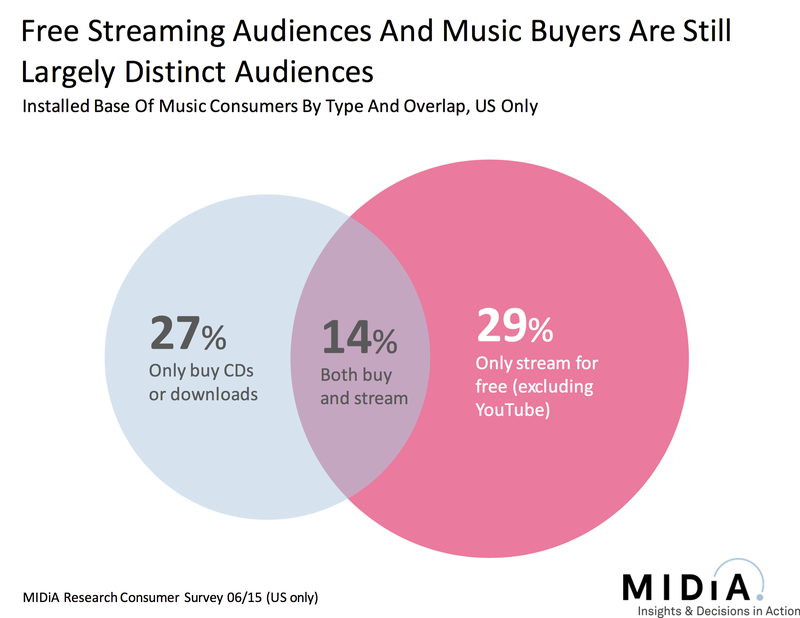 Compare that to 40-50 year olds where 34% stream and 43% buy CDs. These are dramatically different audiences which require dramatically different strategies. Audio streaming is unlikely to be a major factor either way for Adele, neither in terms of lost sales nor revenue. Unless of course she ‘does a Jazy-Z‘ or ‘does a U2’ and takes a big fat cheque from Apple to appear exclusively on Apple Music. But I’d like to think she’d like to think she’d have the confidence of earning sales the real way. What unites Swift and Adele is that they are both mass market album artists and as such are something of a historical anomaly. Swift bucked the trend by making an album targeted at Digital Natives shift more than 8 million units. Adele will likely also buck the trend. But paradoxically, considering the above data, in some ways it will be a harder task for Adele. Swift has a very tightly defined, super engaged fan base that identifies itself with her. Adele’s fanbase is more amorphous and pragmatic. You don’t get ‘Adelle-ettes’. Swift was able to mobilise her fanbase into music buying action like a presidential candidate with a passionate grassroots following and big donors. The importance of digitally engaged super fans is the secret sauce of success for digital era creators. It is the exact same dynamic that ensured UK YouTuber Joe Sugg was able to leverage his fanbase to give his debut book ‘Codename Evie’ the biggest 1st week sales for graphic novel EVER in the UK this year. If Adele and her team do pull off a sales success with ‘25’ they will owe a debt of gratitude to that 27% of consumers. While the odds are against it being quite as big as ‘21’ (simply because the market is smaller) it still has every chance of being a milestone event that will out perform everything else. But do not mistake that for this being ‘Adele saves the music industry’. Album sales are declining. Success from Taylor Swift and Adele are (welcome) throwbacks and they are most certainly not a glimpse into the future. Apple has only ever been in the music business in order to sell more devices. Apple does not need to make money from music nor has it ever needed to. That doesn’t stop it being a crucially important music industry partner (in fact Apple is still pretty much the single most important partner on a global basis). Nor does that mean that Apple doesn’t care about music or that it doesn’t take its role in the marketplace seriously. But Apple is not in this game to make money. Apple routinely ran the iTunes Store at ‘an about break-even basis’ which is financial report code for ‘at a slight loss’. (Or in fact probably at a big loss if half of the costs of the combined iTunes / iPod ads had been factored in.) Now Apple is spending big again on marketing its music product, but this time the ads are only for Apple Music so costs can’t be attributed to other parts of the business. Why this all matters is because it shows us just how seriously Apple is taking Apple Music and also its appetite for running it a loss leader. Why Doesn’t Apple Just Buy Spotify? The hardware-first / Apple-only strategy means that when Apple does buy other services it usually either assimilates them wholesale (remember LaLa?) or it strips them down to the bare bones and rebuilds them entirely (Beats Music). This is all because Apple needs to own the customer relationship and customer experience in its entirety. Apple’s tunnel vision commitment to user experience is the ideology that underpins this entire approach. Which is why Apple didn’t buy Spotify. In fact Apple could make a LOT more money if it simply decided to spend money marketing Spotify to iOS customers. For argument’s sake let’s assume Spotify has somewhere in the region of 6 million US subscribers, that 60% of those are on iOS and that 60% of those iOS users pay via iTunes, Apple thus generates $8.4 million a month in subscription revenue from Spotify. To generate the same amount of US subscription margin from Apple Music, Apple would need 16.9 million US Apple Music subscribers (assuming an operating margin of 5%). In fact, in practice Apple will be in heavy negative margins with Apple Music due to its extensive marketing efforts. So if Apple was in the business of music for making money it wouldn’t even buy Spotify, it would simply spend money marketing it to the Apple customer base. But that has never been the Apple way and is patently unlikely to become the Apple way. Thus Apple will continue on its mission to own every ounce of the streaming subscriber’s user journey. Unfortunately the rest of the marketplace has to try to figure out how to compete while at the same time vainly searching for a profit. Much of the independent label community have come out in public opposition to Apple’s request for a 3 month free trial that crucially would not involve any royalty payments to labels. Besides the fact this has revealed inconsistency in major label licensing strategy (some services have to pay royalties for their free trials) it also raises questions about Apple’s growing role as a content platform. In the old model (i.e. selling CDs on the high street and mall) retailers held all the power, charging labels for prime placement, priority shelf space and carving out additional commercial benefits such as breakage (whereby they were given a discount on a set assumption of a % of shipments that would break in transit, even if they didn’t). In the old new model (i.e. where we are now) the power shifted to the labels with music stores and services having to pay advances, minimum guarantees etc. in order to sell the labels’ content. Even breakage got reinvented and turned into a commercial benefit for labels (they get paid for under usage of services). Now a new model is emerging where a few big platforms are beginning to exercise the power they have been quietly building for the last half a decade or so. Apple, Amazon and Google are all digital content platforms. They each own the customer, control billing, know everything about him/her, control some or all of the hardware and have a diverse portfolio of content assets. Each has also become super important to media company partners. For music labels Apple has become the dominant source of digital retail revenue, Amazon the dominant source of physical retail revenue and Google the dominant digital discovery platform. Each holds the whip hand in their respective area of dominance. Now they all want more. They may each want slightly different things but none are shy of wielding their respective spheres of influence to get to what they want. This is where the indies’ dispute with Apple comes into play. Apple is in the business of music in order to sell hardware and has known for a number of years that streaming is going to be how it transitions that role in a post-download world. It has thus far taken a very responsible approach to its sales role and has been sensitive to the risk of decimating label revenue if it does not time its streaming transition properly. But the first step on that journey has now been taken and the point of no return is fast approaching. Which is why it is crucial that all rights holders have the right agreements in place and which is why the indies are making the noise they are. In an echo of Google’s heavy-handed YouTube Music Key negotiations with indies and DIY artists, one independent artist has claimed that Apple has threatened to remove his music from the iTunes Store if he does not allow his music to be used in the free trial. Whether this is true or not (and it may well not be) is almost not the point. What it highlights is Apple’s power as a platform. Artists and labels alike simply cannot do without iTunes revenue. Whether Apple needs to overtly play the card or not, the implication of the veiled threat is clear. And Apple is not exactly alone. Last year Amazon clashed with book publisher Hachette over eBook pricing and during the dispute employed a number of pressure tactics including: refusing to take pre-orders on Hachette titles, placing a 6 week delay on delivery of them and even pointing users to competitor titles when they searched for an Hachette book. All of these were clear misuse, possibly even abuse, of Amazon’s role as distribution platform but no regulatory body even raised an eyelid. Apple will have watched the development with acute interest. Apple, Amazon and Google are all unique cases. They have become de facto monopolies for their respective sectors, exercising control over the entire platform of user, supplier and interaction between them. There isn’t really an economic term that properly explains them but monopsony is the closest: a company that is the only effective buyer and seller of a product and can thus dictate terms at both ends of the equation. These digital monopsonies are growing pains of the digital economy. After all, we are still in the very early stages of the digital economy. If this were the industrial revolution Robert Stephenson wouldn’t have developed the steam locomotive yet. Consider this phase market adolescence. This raises challenges for regulation with regulatory bodies largely unable to deal with companies that exercise effective monopoly power but that do not meet the criteria of a pre-digital era economy monopoly. Of course the indie labels cannot afford to wait for that dynamic to change so in the meantime they must seize the initiative in this issue and others like it. Right now though the indies have an opportunity to use this case to genuinely move the needle. Apple has pushed them out of their comfort zone. Instead of just digging in their heels they can decided to push Apple out of its comfort zone and request something similarly game changing of Apple in return. In short, turn a defensive move into an offensive one and help set the agenda rather than being stuck in the familiar rut of responding to the one set by the major labels and Apple. Apple Music may have underwhelmed at launch but the company still has the most important music monetization platform on the planet. Most indie labels and majors alike would all but collapse if iTunes revenue disappeared overnight. Right now Apple still wants to play the role of good partner, albeit one that negotiates hard. So the labels still have a chance to help shape what the next chapter in Apple’s music story can look like. That may not always be the case, especially if Artist Connect has developed into a label like service layer 3 years from now, which I suspect will be the case. Apple is no Google, it still wants first and foremost to sell music rather than give it away. That may not always hold true. Similarly the power of the digital monopsonies will likely strengthen over the coming half decade or so. So right now the indies are probably in the strongest position they will be in for some time, even if it might not feel like it to them. They need to seize this moment. With Apple Music barely a few hours old it might seem a little perverse to focus on what Apple needs to do next but Apple’s potential remains more latent than realized. Apple has an opportunity to launch the sort of music platform the industry has been waiting for during the entire digital era but has not yet seen. It hasn’t done it yet but it now has the right materials with which to build it. If Apple is going to make a meaningful long term impact on the streaming market it will need to play the innovation card. Apple music products have been something of the poor relation in innovation terms over the last half decade or so, looking on wistfully from their music downloads backwater while Apple’s devices undergo an innovation and design revolution. If Apple can seamlessly integrate all its assets (radio, podcasts, downloads, on demand streaming, apps etc.) then it could create the most comprehensive and engaging music experience in the marketplace. Imagine listening to a Zane Lowe show on demand, but tracks are played in sequence. You like one of the tracks so you click ‘more by this artist’ and start listening to the latest album. After a few tracks you pull back into the show, listen a bit more and then see a link to an Artist Connect video of an interview by Zane with the last artist you listened to. You jump to listen to that then jump back into the show, decide you want to hear the first couple of tracks and what Zane had to say about them again and jump back to there. In that scenario the user has jumped from semi-interactive radio, into on demand, back into semi interactive radio, non-music content, back into semi-interactive radio, then into fully interactive radio. Of course there are multiple business models at play with multiple rights frameworks but if a user was able to top up on Apple Music credit to use across the entire platform then s/he need never know when boundaries are crossed and the credit would simply get auto deducted from the balance. Implementation wouldn’t be simple (especially form a licensing perspective) but that is the sort of innovation bar that Apple should now be aspiring to. Apple has a unique opportunity to become a true music platform. The first step has been taken (and some of the Artist Connect functionality may prove to be super cool) but now it is time for the real innovation fun to begin. Today Apple finally announced its long, long anticipated entry into the streaming music space with Apple Music. Apple has spent the last few years as the sleeping giant of streaming music watching Spotify et al seize the innovation mantle and dominate both consumer behaviour and the industry narrative. With all the anticipation expectations were understandably high, too high perhaps. Thus in many respects Apple Music underwhelmed (a 9.99 on demand service; a 24/7 live broadcast radio offering Beats1; a fan / artist engagement platform Artist Connect). But there is also more than first meets the eye, there is a nuanced strategy at play. Placing radio centre stage is smart, as that’s how Apple will engage the early follower consumer, who will be Apple’s core target (other than winning back some existing Spotify users). Remember, Apple’s core priority is delivering the best possible music experience to as many of its device owners as possible. A 9.99 subscription service that works for 10% of them is much less interesting than a free radio service that works for 500 million of them. There’s no little irony that Apple triggered an industry knee jerk reaction against free music only to go and put free music at the core of its streaming play. Of course the crucial difference here is that the free music is not on demand. Apple is using radio, real time broadcast and high profile DJs as a way of bringing context and meaning to internet radio for the Apple mainstream (which of course is slightly different from the broader mainstream). Whether Beats1 is enough on its own for that purpose is another question. Beats2 and 3 to follow shortly? Taking The First Step Towards A Platform Play? Apple continues to be ridiculed for its failed Ping! music social network. While it was no killer app it nonetheless represented an attempt to turn iTunes into a music platform. Now that same strategy has been rekindled with the launch of Artist Connect. This is Apple’s attempt to turn itself into an artist-fan engagement platform. Artist-fan engagement is the gold dust of the digital era music business. It’s the scarce, invaluable commodity that music fans crave in a post-scarcity music world. The non-music content is also interesting. Artists can push photos, videos and works in progress to their fans. This combines elements of the D.I.S.C. music format I wrote about here and also the Agile Music concept I wrote about in 2011. There is no reason why music should be a creative full stop in the digital era nor why the static audio file should be the be all and end all. Music fans want more than just the song. There’s no shortage of competition in this space but while DIY sites of various guises are niche, Apple presents the opportunity to reach more than a hundred million of the world’s most valuable (i.e. highest spending) music fans. Sure some of them now pay for Spotify but they’re still iTunes users also. If Apple’s featureset for artist is strong enough, expect strong uptake, especially from the bigger labels and artists. The long term implications are intriguing. If Apple establishes itself as one of the key engagement platforms it will change some of the core dynamics of music marketing. All the while strengthening its hand and establishing an indispensable role for itself if it doesn’t make meaningful inroads into the subscription market. Consider it a back up plan. But even more interestingly, if it succeeds at both subscriptions and marketing then it suddenly has more power than it ever did in the hey day of the iTunes Store. Apple could emerge with the power to break and then make an artist. Once it gets there record labels will rightly start casting nervous glances over their shoulders.